Great news in Rockledge Florida! After a positive discussion on April 7, 2015, about allowing a tiny/small house community within city limits, the Rockledge Planning and Zoning Commission voted unanimously to forward the proposal on to City Council for approval. 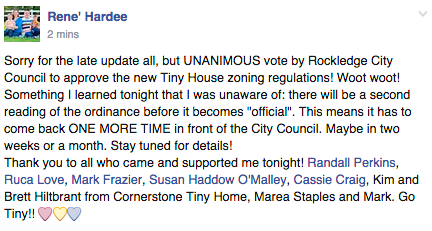 Update 6/27/2015 – Rene has created a Facebook group for a Rockledge Tiny House Community. Please keep us posted on how this develops and if and how they amend their zoning codes. So, are there any Tiny House developers ready to develop this “pocket community” Rockledge in the wings? I’d be interested in finding out more about it. I like the idea of building a tiny house on a foundation and not as a THOW. No developers yet. Potential developers will need to assess the market and feel confident that there’s enough interest, so it’s good to know that you’re interested. Thanks! I ams a licensed Fl Nurse and would buy a tiny home also if I knew it was legal.. I Want in on this community..
Great! Knowing there are people interested in living here will help attract a developer! Please keep me in the loop. Have been interested in a tiny house on a foundation for years. Where in Rockledge ? The specific site is still in the works. We need to find a developer. This is awesome. I am in Palm Bay and I have been wanting to move to a tiny house but was worried about a tiny house on wheels situation and didn’t want to leave Brevard to find land to build it on. Definitely keep me on the loop! I am thrilled about this tiny house community in Brevard County. My Fiance and I are saving $ at the moment to purchase our first tiny home. We are definitely interested in living in Rockledge’s tiny house community! I’m interested in being part of this. Please keep me in the loop. We don’t yet have estimated costs for the tiny houses in the Rockledge community. It will depend on the developer. I was so excited to stumble on this article. I am 50+ and a full-time student at EFSC starting the next phase of my life and love the tiny house movement, except for the tow part. I am so interested in living in a tiny house community. Please keep me posted on the progress. Please keep me in the loop. I am ready to purchase a tiny home. I am new to the Tiny House idea, live in the area, and I am really interested. Will the tiny houses be required to be on wheels, is done under the temporary “camping” laws, what kind of new permits will be required and would you happen to have a link to these permits and regulations available? Great to see the progress in permitting tiny homes. We are working on this in Portland Oregon. Long road but I think we will eventually get there. My husband and I – retirees – plan to have a TH built, and very soon I plan to talk to a builder friend about this. I also want to be kept in the loop. We have lived in Ocala for many years but would love to enjoy the benefits of TH living! (2) Me personally speaking…………..based on what I read, the Rockledge Tiny House Model is “niche market DISTINCTION” within the tiny house world. One of the problems that I have with the Rockledge Tiny House Model of legislation is that house can be up to 1,100 square feet…………. (in my opinion)……..that is NOT TINY ! (3) The Rockledge Tiny House Legislation Model will benefit the “government” of Rockeldge and the people who BANKROLLED the legislation and the politicians who helped get things passed. Due to the fact that when almost anything GETS REGULATED things become “expensive”. In my opinion one of the acid test when it comes to tiny houses is COST. A tiny house is ONLY a “real tiny house” if in fact the price of that house is TINY. If a dwelling cost $100,000 or more…………..in my world…………that’s not a tiny house. Let’s not forget one of the primary factors in going tiny is financial SUSTAINABILITY. In scores of urban cities across the USA U would have homes that by square footage….U could consider them “tiny”, but in price they are not. In places like Miami, Florida, Washington, DC., or in NYC there are scores on “tiny dwellings” that cost over $100k to over $1 million to purchase……….however those places are NOT called “tiny houses”. I live in Florida and have 4 acres of land……..off the grid. I don’t have all of those rules and regulations to abide by as they do in Rockledge. As a ‘tiny house advocate” (who happens to be in Law School)…………there is no way that I want “tiny house legislation” on the books in my neck of the woods. WHY ???? Because as soon as the government gets involved…..BANKERS get involved and “tiny” all of a sudden becomes “over regulated”, EXPENSIVE, and NON SUSTAINABLE. The legislation in the Rockledge model does state POCKET COMMUNITY………….I would call that accurate, but to say that it is a “tiny house” community………….based on what I read which includes up to dwellings that can be 1,100 square feet…………..in the true since of the concept of tiny…………Rockledge is NOT “tiny”. As a “practicing” tiny houser the best places to go tiny is in a place that has a (1) TINY POPULATION. Places that have populations less than 9,000 people. Places that have populations under 1,000 people are ideal places. (2) Unincorporated communities are PRIME. (3) Communities with NO LEGISLATION ON THE BOOKS are PRIME. This applies mainly to locations with small populations. Once the government labels something….your personal freedom (and bank book) erodes. There are multiple ways to “go tiny” and be LEGAL without having legislation on the books.